The Université Fédérale Toulouse Midi-Pyrénées (UFTMP) is a structure that groups together 31 higher education and research institutions in the Academy of Toulouse: 4 universities, 1 national university institute, 18 engineering schools and specialised schools, 1 university hospital, 7 research organisations. Along with its members, its ambition is to raise the profile of the university site as a whole to the highest international academic and scientific levels, and to provide welcoming living conditions for French and foreign students and researchers. The wide portfolio of courses on offer can be divided into four main areas: Arts, Humanities and LanguagesLaw, Economics and Management, Human and social sciences, Science, Technology, Health and Engineering sciences. The Université de Toulouse gathers many research and Higher Education Institutions throughout the Midi-Pyrenees region. Over 100.000 students are enrolled in its 23 higher education member institutions, 7 research organizations and 1 University Hospital. The 15 Doctoral Schools are part of "L'École des Docteurs". 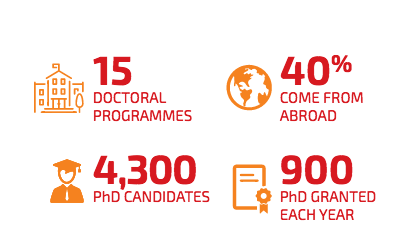 All together, over 5000 PhD students can carry out their studies thanks to the top-ranking training programms in an extensive range of subject areas and to complementary job-oriented seminars/workshops aimed to develop the skills required for a successful professional integration. Situated between the Mediterranean and the Atlantic, in the heart of Southern France and close to the Pyrenees mountain range, the Occitanie region has long been a major crossroads in Europe. Attracting 15 000 newcomers every year, Toulouse, the capital of the region which has been fast growing both demographically and economically, boasts a particularly rich vibrant cultural and artistic heritage. To have the opportunity for all students to live an experience abroad, the Université de Toulouse deploys services to support them in this project. Various mobility opportunities, country profiles, practical information, administrative procedures, student and professional testimonials : the Mouv'Box provides all the information needed to prepare for your departure.